I have written in the past about Parkinson’s recovery being a race won by the tortoise, not the hare. Last weekend, we were at the zoo, and I saw land tortoises and water tortoises, and I thought about all of you. What I realized in watching these amazing creatures was that they were fearless. Today, I remind you that the tortoise wins the race, and I ask you to be the fearless tortoise. 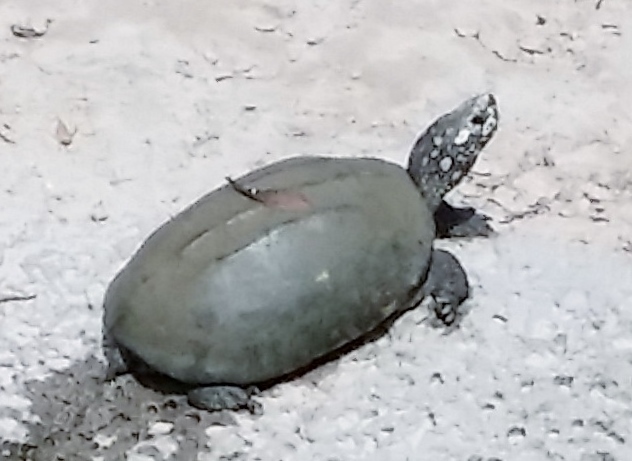 As you can see, this tortoise had just come out of the water onto the beach and was stretching out and enjoying the Florida sunshine. This tortoise was winning the race. Be the tortoise, do the Parkinson’s Recipe for Recovery®, and win the race to your recovery. If it was easy to cure yourself from Parkinson’s, none of you would be on this blog having our dialog. If it was easy to cure yourself from Parkinson’s, it would not be considered an incurable disease. If it was easy to cure yourself from Parkinson’s, you probably would see wonderful results after a couple of weeks and be very happy to be mostly recovered from the disease in a short amount of time. However, it is not easy. So, back to the tortoise. The tortoise believed in himself against overwhelming odds. In a moment of clarity, he knew his path, and he knew in his heart of hearts and soul of souls that he would win the race. He did not stray from the path and he proceeded in the way a tortoise can…slow and steady…and he won. I would imagine that the spectators laughed at him and told him he was out of his mind to think he could win the race. He had to exhibit courage and internal strength to not only compete and win the race, but to ignore the naysayers hovering around his path spouting out their negativity. In this fight against Parkinson’s, we all learn from each other. Today, let’s learn from the tortoise. What else can we learn from the tortoise? TO FEARLESSLY ENJOY THIS JOURNEY CALLED LIFE. TO BE FILLED WITH FAITH AND PATIENCE, SLOWLY AND STEADILY (OR EVEN A BIT WOBBLY), LOOKING AROUND AND SEEING ALL OF THE BEAUTIFUL THINGS AROUND YOU…AND LOOKING INSIDE AND SEEING THE BEAUTIFUL PERSON IN THERE AS WELL. 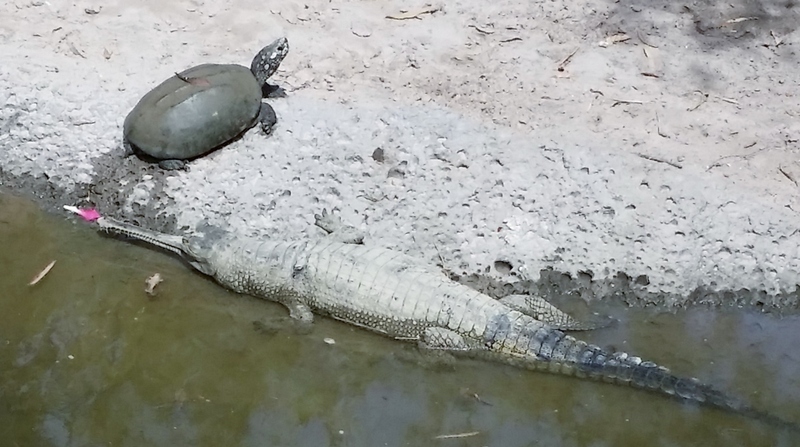 This tortoise swam across the water and climbed on the beach within inches of the snout of the Gharial, a crocodile that is a native to the Indian subcontinent and is known to be a fish eater. The tortoise had complete faith in the Gharial’s eating habits, complete faith in the zookeeper’s decision to put them in the same area, and complete faith that it would be okay to come within inches of the Gharial’s snout without harm. With this complete, unwavering faith, the tortoise became fearless. And then, it could calmly enjoy the Florida sunshine, still within a foot or so of Gharial, and facing in the opposite direction from this crocodile. How about you? Let’s find your faith! How about complete faith in your cure so that you can see your increased tremors as meaning that you are generating more energy, so this is a good thing. How about complete faith in your cure so you can ignore what others are saying, and instead have compassion for them as they do not not understand Parkinson’s recovery. How about complete faith in yourself, the Recipe, and your Higher Power so you too can FEARLESSLY enjoy this journey called life. “The tortoise is filled with faith. I am filled with faith. The tortoise moves slowly, so it can be patient and enjoy life. I am moving slowly, so I can be patient and enjoy life. I am my own cure. Yes, my friends, each and every one of you is worth it!!! In your post you invite me (and others) to “to be filled with faith and patience, slowly and steadily (or even a bit wobbly), looking around a seeing all of the beautiful things around (me)”. I look up and I see you, dear soul,…. patiently guiding and shepherding me to health. You know, it must be a tortoise week because yesterday, one of my favorite Facebook posts was that of a 140 year old sea turtle with a tiny day-old offspring balanced on her head. Sometimes I feel a little like that offspring…..such a big world…so much ahead of me….. but, slow and steady, huh? In some ways, I think you’re kind of like that old tortoise….you’ve been slow and patient….you recovered….so much wisdom for such a young guy. Thank you for these wise words. Your timing is perfect, I’m struggling at the moment with being positive and believing in my ability to heal myself. I needed to be reminded I’m not a hare, I’m just expecting too much too quickly. It’s a week of tortoises for me, a neighbour called on me to look in my garden yesterday for his lost tortoise, it wasn’t there but was later found safe and well on the other side of the street. They are not sure how he got out but he must of been on a mission slow and steady, little by little – just like me and all the other people you are so generously helping. One of your best, Howard!….Inspiring and thought-provoking. Great timing, lately I have no energy….dizzy…. this makes me feel more steady and calm instead of tired and shaky. How can you grow faith? Start with Courage marry that to a positive attitude and you get HOPE. Marry HOPE to Certainty and you get FAITH. We used to say “Keep the Faith” I suggest we “Grow the Faith”. Like the determination of the tortoise, Faith requires inner strength and courage. Look for it and you’ll find it within yourself because “YOU Are Worth IT!”. Dear Howard – your words always come at just the right time. I’m doing the recipe to the best I can at the moment and was feeling really discouraged about lack of progress & seemingly more symptoms. To be reminded that I’m a tortoise and didn’t get here instantly and let go of unrealistic expectations lifted my spirits and renewed my hopes. Thank you so much you help me believe. Oh my! How appropriate! I’m nearly at a standstill these days do love the analogy Howard! It’s been said so often, you always seem to know just the right words at the right time. God in motion! It is so nice to have support from positive people. It helps to be running/walking this race with like-minded people who understand, like few others, what it is like to be in a PD mind and body. Thank you, Howard for your faithful and timely encouragement. You are a GIFT FROM GOD!!! It didn’t take us overnight to get where we are and it will take more than overnight to get beyond it. Come on, Fellow Turtles, let’s stay the course. Let’s keep our eyes on the PRIZE! Sue and Joe’s comments are exactly what I would like to say, “Dear Howard – your words always come at just the right time. I have now my Hope and my Knowing, that I recover, back again. Thanks. Thank you to Howard and to everyone else for their beautiful comments. The world is a beautiful place and there is much to love and enjoy. I am grateful for the health that I do have today, for my faith in God and for the support that I have. I to will keep the faith and remember the tortoise as I enjoy this journey. Have a wonderful week. This is fantastic! I feel Howard should be consulted by the Parkinsons’s experts because Howard is giving genuine hope in reversing the symptoms. I know first hand that when I become emotionally upset, my symptoms become worse. On the other hand when I am calm, there are no symptoms. And sometimes I have not taken the meds and when I am calm and think POSITIVELY, there are NO SYMPTOMS! HMMM! You are on to something BIG, Howard. Once one is given the diagnosis of Parkinson’s, the Doctors do not care to think outside the box. You’re labeled forever and meds are dispensed. Howard is CURIOUS, OPEN TO THINKING OUTSIDE THE BOX. Howard is intrepid and is full of WONDER. Amazing possibilities and stories that he will be telling. Stay tuned. Breakthroughs are so possible. Miracles happen. BELIEVE! A big thank you, Howard. I have been away from your blogs and have just returned.